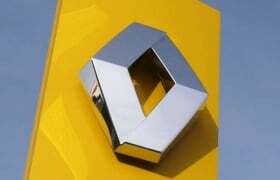 LJUBLJANA, Slovenia (Reuters) -- Renault's Slovenian unit said it will cut production this month and reduce its work force by about 4.7 percent by the end of the year due to lower demand. "From Sept. 19 till Sept. 28 the production will be reduced to one shift [from two] because of a drop in orders," the unit, Revoz, said in a statement. The unit builds the Renault Twingo minicar and the Clio subcompact. In that week, the production will be cut to 300 from 600 cars per day, spokeswoman Nevenka Basek told Reuters, adding the company planned to cut the work force by the end of the year by about 100 people from some 2,150 at present. The unit said demand has fallen in Europe this year, particularly in France where Revoz sells 52 percent of its production. Revoz is Slovenia's second largest exporter but was forced in April to reduce production to two from three shifts and cut workforce by 13 percent due to lower demand. The company last year produced 174,127 cars but gave no production estimate for 2012.